18 years ago, I sat behind my school desk, hands placed neatly in front of me, and sharpened No. 2 pencils lined up perfectly. I probably wore a plaid jumper, and my long brown hair was pulled back in two, very symmetrical, very neat, French braids. Firefighter. Teacher. Mom. Doctor. Astronaut. Mom. Veterinarian. Mom. Baseball player. Artist. Mom. Rockstar. Writer. Mom. I looked around at all of the other girls in my class. Future moms. All of them. Over the years, my desired future profession changed again and again, but “motherhood” never quite made it to the top of the list. I never liked dolls. Babysitting didn’t interest me. Sure, I’d have kids…after I went to law school, wrote my first book, and made a name for myself. Deep down, I just wanted to have influence – I wanted to do something great, something that affected lives. Fast forward to today. God has answered my deepest longings, but certainly not in the way I expected. Here I am, the mother of 2 children. I’ve yet to write a book, I’ve never been to law school, and I will never reach “household name” status. Somewhere along the last 18 year road, God has changed my mind about motherhood. He’s called me to something great, something life-changing, something influential. 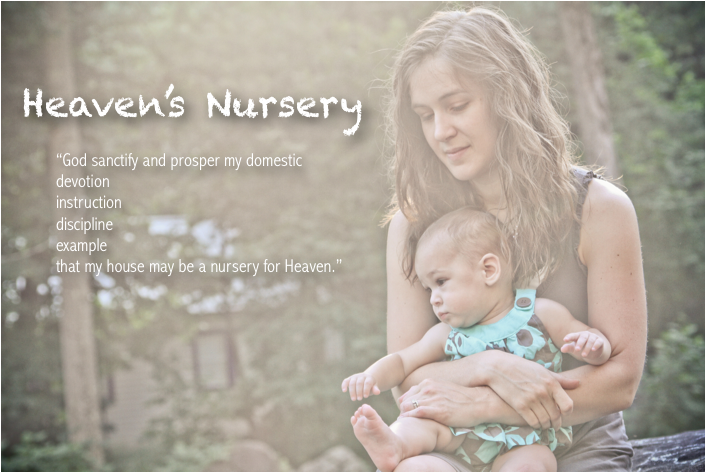 He has called me to transform my home into a beautiful nursery for Heaven. And he’s teaching me, as I teach my children, that real influence comes as I lay down my life for others. I don’t want to write a blog because they’re trendy (even though they are). And I certainly don’t want to write a blog on motherhood because it’s been easy, because it’s a dream come true, or because I’ve got an edge on motherly wisdom that the world needs to hear (because I most certainly don’t). I’m starting this blog because I NEED IT. I need the written reminder, the chronicling of memories, of treasured moments. I need to write down lessons learned, both for me and my children. I need to be able to look back, years from now, and see how God’s grace is transforming my home, my family. God has called me to greatness. So happy to come across your post tonight. Looking forward to reading more about what God's revealing to you through motherhood and whatever else he places in your path. Your perseverance is inspiring - God's called you to greatness indeed. Megan - I can say that I share those same thoughts as you wrote/spoke about tonight. I have had the pleasure of growing up with you and watching you change and grow. I have to say that you have influenced people more than you think you have throughout your 20 some years on this Earth. You have been a great example of a Christian women, friend, sister, daughter, cousin and now wife and mother!!! I look forward to reading your blogs and experiencing life along side of you yet again! Thanks for always being a great friend and supporter!! You never judge!! One of your finest qualities!! !